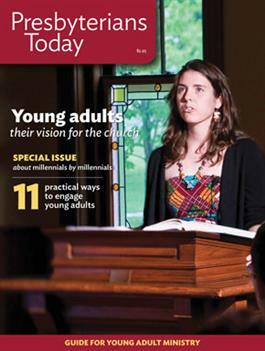 This special issue published by Presbyterians Today is a must-read for everyone who wants to better understand young adults and engage them in worship, education, and service. You may be surprised to hear how ardent young Presbyterians are about their faith and their church — and how much they want to get involved. But knowing the things that turn them on — and off — can make all the difference in how successful you are. Our Guide for Young Adult Ministry was planned, written, and edited by a diverse team of young Presbyterians. Read along as they passionately cast a vision for the church they love, offer practical guidance for church leaders, and share their own stories and personal reflections. What they say may surprise you — and definitely equip you to look at young adult ministry in a new way. Full of stunning photos, resources, compelling editorials, and online bonuses, this special issue is perfect for congregations, small-group studies, pastors, visitor packets, youth groups, sessions, and officer training — and it may be just the right thing to give to the young adult in your life.